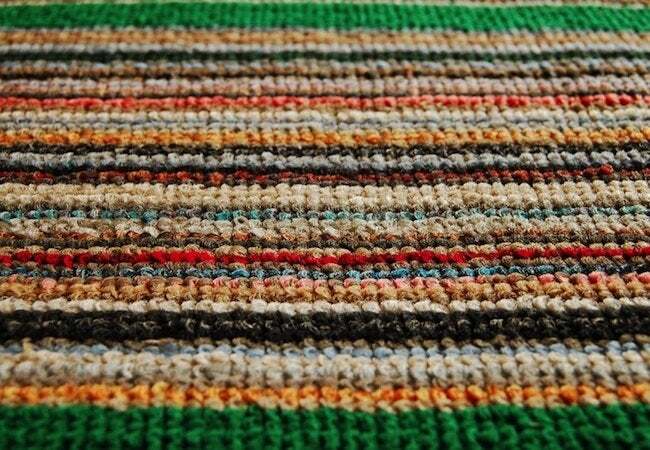 From muddy boots to spilled drinks, your carpet undergoes a great deal of wear and tear. That said, in the case of splattered paint, you might assume your carpeting has finally met its match. Maybe, but not always. You may be able to rescue your carpet with nothing more than water, soap, and elbow grease. Here's how. It’s the stuff of nightmares for any do-it-yourselfer who takes on a weekend painting project. Even though you carefully covered the floor with drop cloths or plastic sheeting, drips and drops of paint still somehow managed to reach the carpeting underneath. It’s frustrating, to be sure. But the good news is that, more often than not, you can remove paint from carpet using only a handful of everyday household items. So for the time being, hold off on shopping for a replacement carpet. Whether the paint remains wet or has had time to dry, it’s well worth trying to undo your mishap by following these simple step-by-step cleaning instructions. If you notice the accident right away, move quickly to act before the paint dries. Blot, Don’t Scrub. Whatever you do, no matter how desperately you want to remove paint from carpet, resist the urge to scrub. 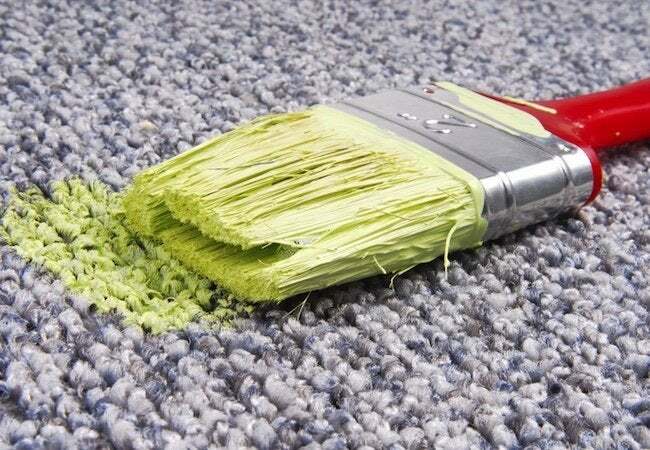 The last thing you want to do is force the paint into the fibers of the carpet. Instead, with paper towels (lots of them), gently blot up as much of the paint as you possibly can. Grab the Dish Soap. With all or most of the excess paint out of the way, you can focus more closely on treating the affected area. In a small bowl, combine warm water with a modest amount of dish soap. Soak the corner of a clean rag in the water-and-soap solution, then continue blotting the stain. Start on the outside and gradually work toward the center. If, along the way, moisture accumulates on the carpet, soak up the water with paper towels. Continue blotting until you’ve removed all the paint. When All Else Fails. So long as you’re dealing with latex or water-based paint, you can expect to see results with the combination of diluted dish soap and the blotting method. But if you don’t seem to be getting anywhere, remember that you have one other viable option: commercial carpet stain remover. Application techniques vary by product; be sure to act in keeping with the manufacturer’s instructions. If you failed to notice the stain on the carpet until after the paint had dried completely, don’t lose hope. Removing dried paint takes more work, but it’s not impossible to do. Clear a Path. Before doing anything else, first scrape away any loose, flaking bits of paint with a table knife (sharp enough to do the trick, but not so sharp that it would damage or cut off the carpet fibers). Soak the Area. In a small bowl, combine hot water with a modest amount of dish soap. Carefully pour some of the solution onto the stain, letting the soapy water soak into, and soften, the dried paint. Steam Power. If the hot, soapy water did not succeed in softening the paint, plan B is to steam the area using either a handheld steamer or a clothing iron configured to the steam setting. Note that if you end up using an iron, place a wet rag between the carpet and the iron to avoid scorching the fibers. Scrape and Blot. Now that the dried paint has softened, go back to gently scraping it off the carpet fibers, bit by bit. If and when necessary, blot the paint with a moistened rag or dry paper towels. When All Else Fails. Many homeowners have managed to rescue their carpeting by following the steps described above. Given all the variables at play, however, no technique can be guaranteed to work in all cases. If, for all of your efforts, some paint residue still remains, don’t hesitate to give commercial carpet cleaner a shot. Indeed, even when you’re very careful, there’s always a chance, however remote, of paint ending up on the carpet. It happens to the best of us. Sure, a mishap like that might ruin your day—but it doesn’t have to ruin your carpet!